Do your clothes match your energy level? It is just me or do you get days this time of year where you feel you are just slogging around with no energy? I start to chalk it up to the lack of daylight hours and seasonal affect disorder, but sometimes the problem can rooted in your wardrobe selections as well. The colder it gets, the more clothes we put on. And while layering works well to keep us warm, it can restrict our movement and add weight to our shoulders, back and feet. Our wardrobe seems to get progressively heavier, whether it’s the weight of the fabrics we are wearing or the multiple layers required to keep from freezing to death. Think about it, if you put your winter coat, boots, mittens, hat, scarf and extra sweater in a black garbage bag and start carrying it around the house like Santa Claus for a day, you’d be worn out! Not only that, two or three layers on our arms and legs to stay warm means more effort to bend and move our extremities. No wonder we feel zapped at the end of the day. The more clothes or bulk you have on, the more “drag” it causes as you move. I love my warm Scandinavian sweaters and fleece sweat pants, but just moving my arms back and forth or walking around I find a resistance I don’t experience when I’m wearing a satin jacket or skinny jeans. When clothes are worn snug to the body and have a slippery surface they give us energy, that’s why most of the clothes you see for intense work-out wear is made of some sort of spandex, but yoga wear is often comprised of soft and fluid materials, helping you relax and slowing body movement. Incorporate this idea into your everyday wear. 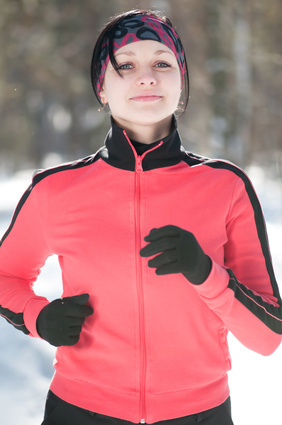 For a busy day, wear light weight slippery layers, like stretchy athletic fabrics next to the body that wick away moisture, and jackets with fleece on the inside, nylon on the outside. Choose boots that snug into your ankles and allow movement or wear athletic shoes with thick soles, to keep your off the freezing ground. For those lazy low-key weekend days, go for the flowing layers and bulky fabrics will help you relax and feel cozy. God gave the bears a warm heavy coat in the winter, is it any wonder why they hibernate? I’m just happy he gave us choices. So go out there and have an blessed, beautiful and balanced energy day.